Paint Draw Paint, Learn to Draw: Quick Note: Copying as a way to learn to draw. Quick Note: Copying as a way to learn to draw. One way to learn to draw or paint is by looking at work by other artists and trying to duplicate the image. In grad school was I reintroduced to copying artwork to learn how to draw or paint. When I was young I used to copy from comic books or whatever else I liked for fun. I did not actively look at other work to see how it was done. I just drew what I liked. I did not realize that it could be a valuable way to learn. 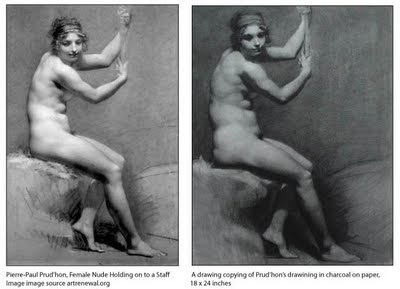 It was in one of my figure drawing classes where I was first assigned to copy paintings done by established artists. 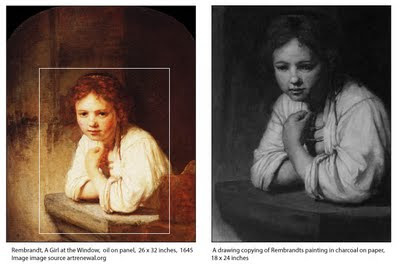 There the goal was to learn how other artists accomplished task and resolved problems by figuring out how they did it. It was not easy and was sometimes frustrating but I did learn from it. Here is a Prud'hon drawing along side my copy I did in charcoal. The goal was to recreate the image as close to the original as I possibly could. I did this exercise to learn new techniques to incorporate into my own artwork. Drawing using another drawing as reference allows us to work on a couple of areas. We can choose to copy the drawing technique or just us the drawing as reference to learn about something within the drawing, for example value relationships or anatomy. 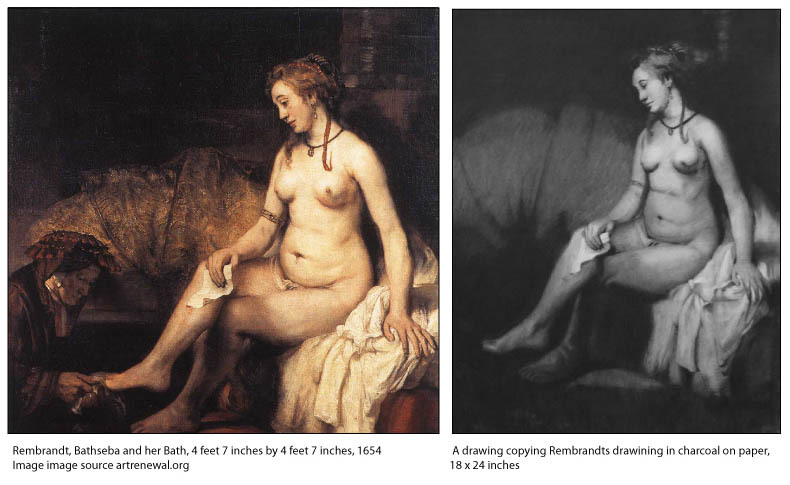 Here is the painting Bathsheba at her Bath by Rembrandt along with the drawing I did. Drawing a copy of a painting offers different challenges. We are basically learning to translate the image into a different medium. This means we are not trying to duplicate it stroke for stroke or line by line. Instead, we are trying to examine what we see and break it down into bits of information that allow us to illustrate it. Since I was focusing on learning to draw the figure when doing these I chose artwork that allowed me to study that. This learning technique will work for any subject. If you like to paint landscapes find a landscape artist you like and try to figure out how that artist painted it, then recreate it. Any subject will do. Just find the stuff that interests you. You can use any artist in any medium. Here is an example where one artist looked at a contemporary artist to learn from. My advice is to find something you enjoy drawing or painting that has the elements of what you want to learn. Try it out. It is a great way to learn drawing or painting technique. 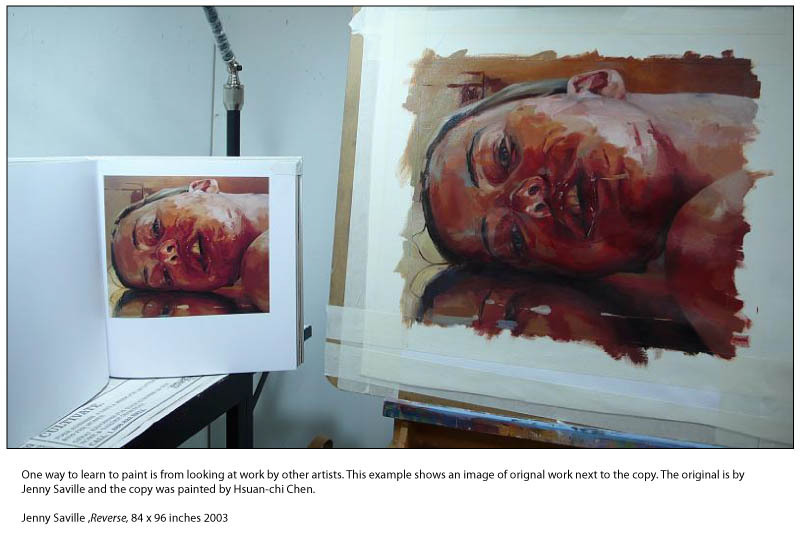 The copy was painted by Hsuan-chi Chen.